Alzheimer’s disease is the most common form of dementia, a degenerative brain disease in which the brain size decreases. Of the 9 types of dementia, Alzheimer’s accounts for well over 60%. 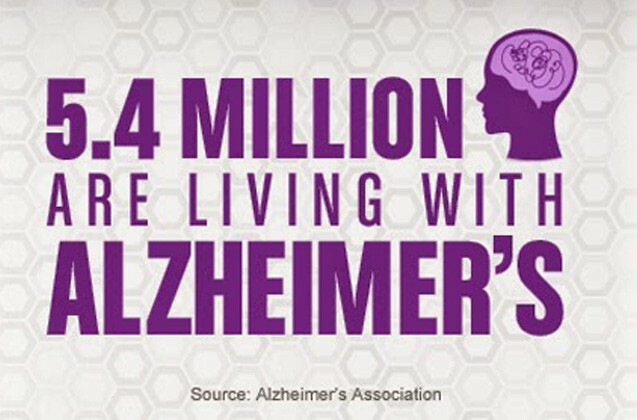 More people die of Alzheimer’s disease than of breast cancer and prostate cancer combined. Yet, the awareness level of this debilitating disease is lower. Research funding also lags behind many other diseases. Although medical research has several clinical studies (at various stages) to treat Alzheimer’s underway, there is no cure on the horizon. Current medical treatments may slightly reduce some of the symptoms. Alzheimer’s disease may be developed by a number of factors. These may include: genetics, head trauma, environmental toxins (e.g., aluminum) and compromise of the vascular system due to diet or lack of exercise. Two abnormalities in the brains of people with Alzheimer’s disease are called tangles and plaques. While experts are not clear if tangles and plagues cause the disease or are the result of it, their physical presence causes the brain to shrink. As the disease progresses, sufferers become compromised due to lessened ability to eat and swallow which can lead to infections. Arizona has the 8th highest death rate of all states and there are over 120,000 people 65 years and older with Alzheimer’s disease. Alzheimer’s can only be diagnosed by qualified medical professionals. However, learning about symptoms, can help family, friends and caregivers better understand this complicated disease. Music has proven to have a calming effect on those suffering from Alzheimer’s disease. Caregivers would do well to question spouses, siblings and long time friends about musical preferences of people affected and unable to articulate favorite songs. Literature suggests that typically music from when a person is 16-25 years old anchors well in the mind and is thus recalled. Stress reduction in those suffering from Alzheimer’s has cascading benefits to all involved. There are many Alzheimer’s resources and support groups available.